The 26th International Summer Meeting on Electricity, Industrial application (RVP-AI/2013) was held in Acapulco, Mexico on 7 – 13 July. Our company was presented at the booth of Apfelbaum Inc, which represents GlobeCore(tm) in Mexico, Venezuela and the US. Visitors of the expo were quite interested in the laboratory/test-bench transformer oil vacuum regeneration system UVR. GlobeCore lead engineer Evgeniy Svirid demonstrated the process of used oil treatment. The regenerated samples exceeded expectations of the audience. Average regeneration output from used oil with 2-4 % of solid contaminants and water was demonstrated at 75-85 % (depending on mode of regeneration). After the experiment, several companies experessed interest in running the test with their own used oil. “We have been working with GlobeCore for about a year and I must say there is positive dynamics”, says Octavio Manzano, Apfelbaum Industrial’s President. “The products are being improved and I think this is the result of new additions to the team. I enjoy working with young professionals, especially when they are so interested in what they do”, Mr. Manzano added . 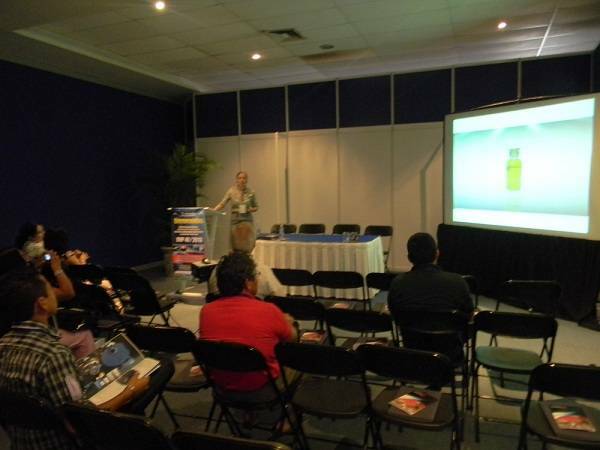 The presentation of GlobeCore was concluded by a conference, lead by export department manager Olga Vorkun. This event focused on transformer oil regeneration technologies. Possibility to reuse the sorbent for 2 – 3 years or up to 300 reactivation cycles.